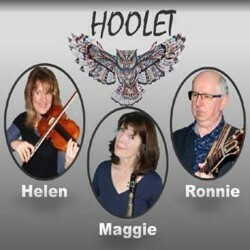 Having performed recently to rave reviews at venues around the country, there is a definite buzz around this trio of outstanding musicians: Hoolet. Guitarist Ronnie is a seasoned journeyman. Singer Maggie is deeply rooted in traditional folk music. Helen is a classically trained violinist but with the beating heart of a fiddler. Three disparate strands that, when woven together, create music that is uplifting, exhilarating and often deeply moving. Featuring a blend of traditional folk songs, classically influenced pieces and Ronnie's stunning originals, this promises to be one of the highlights of the Fringe. Don't miss out. Book early.